Specialized Labels of All Categories. Shipping Labels, many DOT Placard Labels. An abundance of DOT Labels available. Click here to see our generous stock. Shipping Label s is extremely important in the doing of business today. Shipping labels are a very important item in multiple facets. Marketing value, and protection advertising for handling. 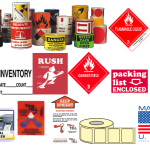 Direct Thermal Labels for your shipping and Thermal Transfer for inventory labels. There are different material that be used in producing each of these types of labels with adhesive coating. The material to be used in making any of them depends on the nature of the surface where the label will be placed. Other factors like the purpose of the label, the required longevity of the label, the conditions to which the label will be exposed to and the likes are also taken into consideration when deciding on the material for producing the labels. 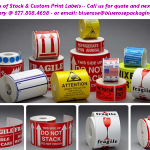 Water based adhesive labels for example, are not suitable for moist environment. So, if the shipping labels are going to be used under such condition, other options will be better than water based adhesive. 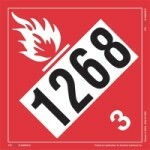 Suitable environment for labels made of water based adhesive is dry environment. If you use them on wet environment, they will definitely go off no matter the type of surface they are placed on. Adhesive labels made of rubber materials are sticky. However, exposing them to UV rays of the sun for a prolong period of time will affect their effectiveness. Hence, such labels are not good to be used on items that will expose them to sunlight. 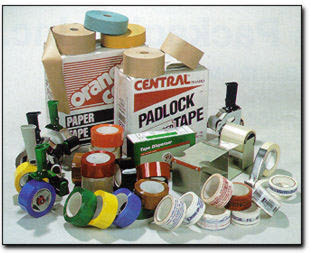 Other types of materials which can be used in producing adhesive labels is of acrylic material. If you are looking for where to buy quality adhesive labels then you have to visit Blue Rose Packaging. This is an online store that deals with different types of shipping labels and packaging materials.